Freezers can preserve food for long periods of time, but forgotten steaks and waffles eventually end up with a coat of ice. It looks harmless, but the smell and taste once the food is defrosted isn't exactly how you remember it. So what’s happening to your food? 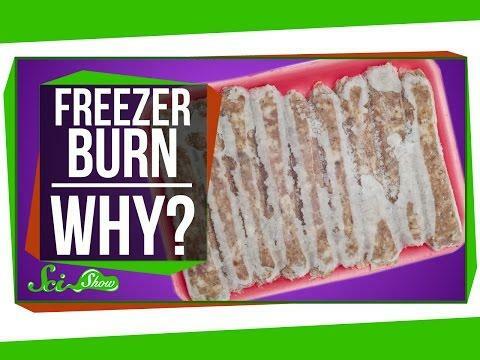 The guys over at SciShow break the science down, plus ways to keep frozen meals fresher, longer. Here's the deal: Once food goes into the freezer, whether it's a steak or a bag of vegetables, it dries up and produces thousands of water molecules. Some molecules sublimate over time, which means it turns from solid ice to water vapor. This leaves food completely dehydrated and crystallized, dulling the color and ruining the flavor in the process. Even though frozen foods don’t decay and are generally safe to eat with these crystals, the new texture and taste may be unappetizing to consumers. Fortunately, there are a few ways to keep this from happening. According to the National Center for Home Food and Preservation, there are several foods that don’t freeze well, such as cooked pasta, rice, cabbage, lettuce, cucumbers, sour cream, cheese, mayonnaise, gelatin, and fried foods. They could wind up limp, smelly, soft, mushy, rubbery, and even curdle overtime. But if you do freeze vegetables, it’s best to blanch them beforehand in order to increase the amount of moisture it retains. For freezer-friendly foods, such as meats and ice cream, use durable and leak-proof containers that are resistant to oil, grease, water, and don’t become brittle or crack at cold temperatures. Plastic bags are also a reliable choice for storage; however, plastic wrap and tinfoil can trap pockets of air and actually expedite freezer burn. Also, avoid keeping foods in the freezer too long. Meats can safely remain in the freezer for up to a year, while lunch meats, bacon, and hotdogs can only be kept frozen between one and two months. Make sure to maintain the storage temperature at 0-degrees Fahrenheit or lower. While freezers have made it possible to preserve foods safe for longer periods of time, if you don’t keep tabs on your freezer expirations with dated labels, the burn may force you to routinely toss out what could be perfectly good containers of ice cream and leftovers every year.